It's the season for baseball, hot dogs, apple pie, and a Mexico-made Chevrolet. Each summer for the past decade, General Motors has used the Detroit Tigers' center field fountain to display two vehicles. This year's initial choices — a Chevrolet Blazer RS and Silverado 1500 LT Trail Boss — were curious given looming UAW contract negotiations and criticism of its plans to possibly close five North American plants. 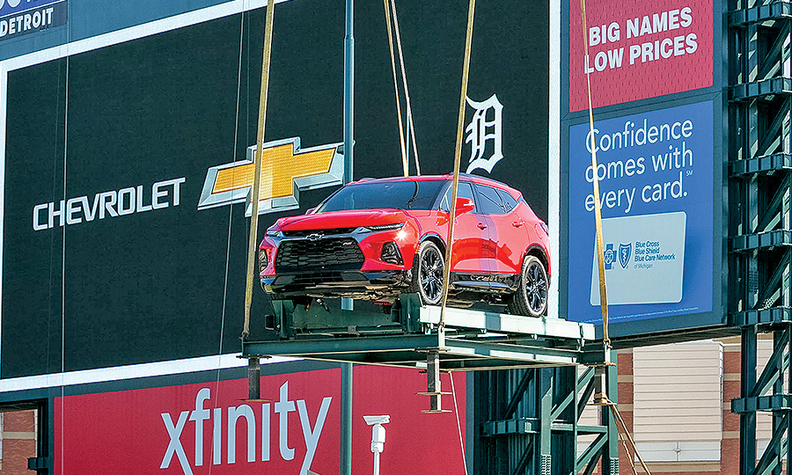 When the vehicles were installed last week ahead of the Tigers' April 4 home opener, GM told WXYZ-TV that it picked the crossover and pickup because they're the newest vehicles in Chevy showrooms. Its choice of the Blazer, though, reignited anger over GM's plant cutbacks. Union leaders have condemned the company for assembling the Blazer in Mexico while cutting jobs in Canada, Ohio and Michigan. "It's a slap in the face for American workers to showcase foreign-made cars alongside America's pastime," Ryan said in a statement last week, adding: "This tone-deaf display is an insult to their tireless work and dedication to this company. GM should know and do better." Indeed, days later and well in time for Opening Day, a chastened GM quietly swapped out the Blazer with a Michigan-made, UAW-built Chevy Traverse, the Detroit Free Press reported.